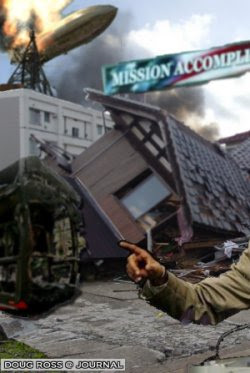 Doug Ross @ Journal: Mission Accomplished! Did Obama intentionally nuke the economy? Mission Accomplished! Did Obama intentionally nuke the economy? Is President Obama intentionally attempting to bring the stock market to its knees? Some argue that, indeed, he is. "The free market has failed," he could say, "just as it failed the housing market!" • Lied about "tax cuts for 95% of Americans", offering instead $13 a week, achieved not through tax cuts, but by changing the federal withholding tables! 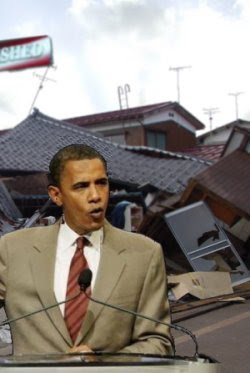 Why would Obama inflict these destructive policies while the economy is collapsing? Simple. Each step strengthens the role of government in people's lives. • Squelching the stock market kills its attractiveness as a parking lot for private capital. Combined with an increase in the capital gains tax, investors will swarm to bonds -- tax-free vehicles like municipal bonds, which benefit the growth of state and local government. And unions, of course. • Carbon cap-and-tax will raise taxes on all Americans as the cost of goods and services will increase to address a non-existent threat. • True tax cuts would grow the economy, which is why, of course, Obama shuns them. The last major recession was Jimmy Carter's malaise. It consisted of of double-digit inflation and unemployment. It was finally licked by across-the-board tax cuts for everyone (even the despised rich), which touched off a twenty-plus year run of prosperity. • Charities reduce the role of government assistance for those in need. That, in Obama's world, can not be tolerated. That is why charities must be choked off and allowed to die. Especially faith-based institutions. The only plausible explanation is that Obama's destruction of the economy is intentional. It is based on a failed ideology that has a track record of Mugabe-esque disaster. And I'm not the only one who thinks so. Jim Cramer is a long-time investor who's been around the block a few times. He thinks the Obama agenda is crystal clear, stating "...their agenda is destroying the life savings of millions of Americans... we've elected a Leninist." 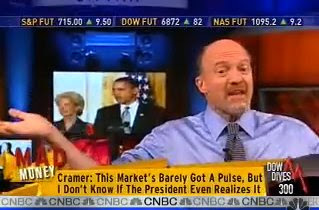 Cramer went on to say that President Obama has caused "the greatest wealth destruction I have seen by a president." Cramer calls it an "assault on the economy" by the President and his cohorts. If all of this comes as a surprise to you, I'm guessing you never saw The secret scrapbook of Barry Soetero. Because if you had, you would've known. It is tragic-comic that both the President and Robert Gibbs have both stated that they will not comment on the day-to-day "fluctuations" of the stock market (despite that often they themselves cause those fluctuations - invariably downward. And "fluctuations" implies that the markets sometimes rise - rarely under this President), but if a radio or TV talking head like Rick Santelli or Rush Limbaugh says something that opposes Obama, both the president and Gibbs immediately, and often repeatedly, rise to the challenge. So commenting on situations that adversely affect the jobs, investments, or retirements of millions of Americans is beneath them. Challenging dissent, however, is job one for this White House. Hat tips: Mark Levin (MP3), S, C & A and Larwyn. Linked by: Instapundit, Power Line, The Anchoress, Jules Crittenden, Protein Wisdom, Fausta, JoshuaPundit and Memeorandum. Thanks! I sort of agree with you, while i dont think he is doing it on purpose his economic and jobs initiatives sure arnt making a DENT in what is already a horrible depression. Tax cuts for the rich have never worked and never will... Try another lie. GIHA...I always save this link for morons like you. Read it and weep. He's an idiot. He's gettin out of office, come Nov !